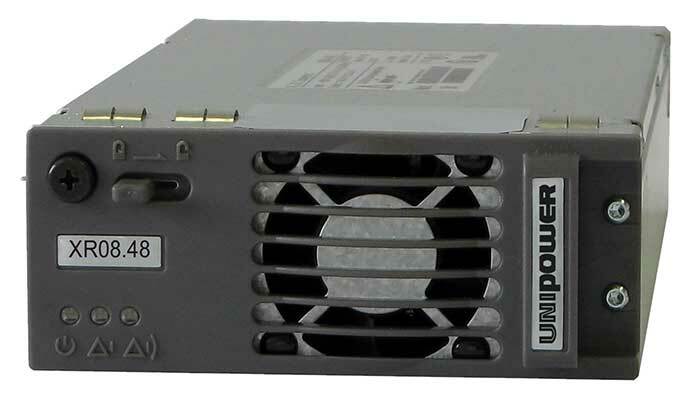 The XR08.48 is a single-phase, hot-pluggable, fan cooled 17 amp rectifier. The high power density of this products offers the optimum 1U shelf solution for space-critical applications. The XR08.48 17 amp rectifier offers excellent efficiency as well as wide operating temperature and wide input voltage range. Together with advanced technology they enable cost effective and reliable solutions. The typical applications for this 18 amp rectifier are both in indoor and outdoor environments, which is ideal for broadband access, cable head ends, micro/pico BTS Cells, Enterprise E911, and GSM-R applications.